Sports fans are always debating which team is the greatest of all time. 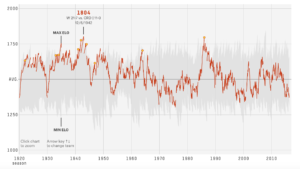 At FiveThirtyEight, an interactive data visualization examines the history of the National Football League using an Elo rating, which is a simple measure of strength based on game-by-game results. This allows viewers to quickly examine over 30,000 ratings and evaluate how each team has performed across decades of play. This engaging data visualization contextualizes the ebb and flow of each NFL franchise. At a glance, viewers can compare how their team measured against the best in the league. By diving deeper into the data, the viewer can begin to examine why their team saw an increase or decrease in Elo. 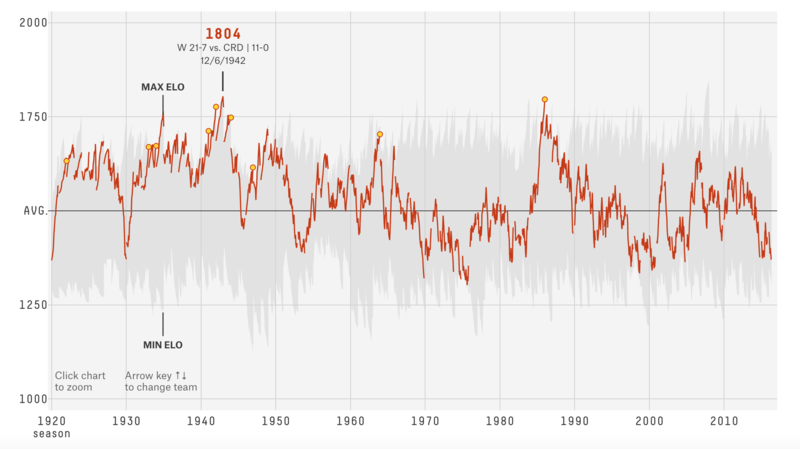 For example, in 1989 the Dallas Cowboys had the worst Elo rating, but three years later, they raised their rating by 500 points to reach the top. This can largely be attributed to the drafting of future Hall of Fame players Emmitt Smith and Darren Woodson. Ultimately, this simple visualization allows viewers to quickly analyze the complete history of the NFL, and better grasp the the impact players and coaches had on their franchises. This entry was posted on Monday, October 31st, 2016 at 1:30 pm and is filed under DATA VISUALIZATION. You can follow any responses to this entry through the RSS 2.0 feed. Both comments and pings are currently closed.